April 2015 Nepal earthquake devastated large swaths of the country, a scale of damage so large that the country has initiated a survey that spans 14 districts and over 800,000 households. 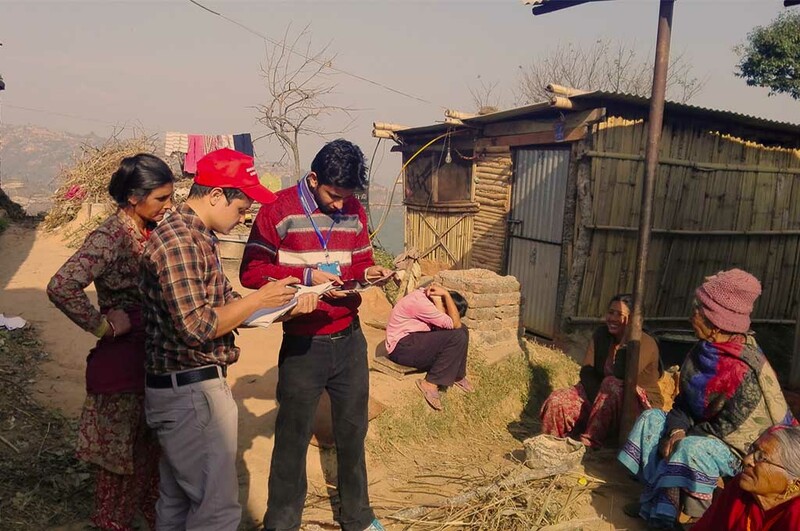 Through this survey the Government of Nepal (GoN) is planning to have a comprehensive housing damage assessment data. This survey is being conducted by trained engineers using a uniform criteria to ascertain the damage of the nation’s housing stock. The collected data from the survey will also be used to identify earthquake victims in need of housing assistance. The National Reconstruction Authority (NRA) will use the database created as the basis of all GoN initiated housing reconstruction programs and the data will in turn act as an effective accountability tool. Collection of massive volumes of photographic and textual data in order to provide multi-dimensional understanding of the damage that has occurred to each building assessed. Collection of data has included information on physical damages to building structures, socio-economic attributes of the residents and regional demographic information. Enabling near real-time validation of these data in order to inform and expedite the subsequent repair, retrofitting and reconstruction projects. Storage of about a million records of households collected using mobile devices. These records are hosted and managed on a Central Database capable of receiving the data remotely over the internet. Creation of a Cloud Infrastructure (central database, physical servers, hardware and software components) that is robust, reliable and scalable. Creation of a system which facilitates robust validation, progress tracking and visualization of the hosted data. Transfer of data to the Ministry of Federal Affairs and Local Development (MOFALD) database, where the collected data is used, to ascertain the damage to housing stock against a uniformly applied engineering criteria and identify beneficiaries eligible for housing assistance to be administered by the GoN. Kathmandu Living Labs is providing technical assistance to the GoN via the Central Bureau of Statistics in surveying, hosting, validating and disseminating all collected data. Keeping the central challenges of this project in perspective KLL, developed and deployed the following solutions. Offline data collection and validation suite which does not require connectivity of any kind while collecting data on the field. Image compression algorithm which compresses captured images, reducing size of a 2.5 - 3 MB photograph to around 300 KB with minimal loss of image quality. Separation of photo and text data to allow uploading of survey data using low bandwidth internet connection. Separate uploads of text and image data of the same survey is automatically synchronized. Automatic generation of statistics (counts of surveys started and completed over different periods of time) and the sending of these statistics to a pre-defined SMS receiver via a simple button push. MIS System: Collected data reaches the central server at GIDC, these raw data and photos are made accessible through a secured and customized MIS (Management Information System). In order to facilitate near real-time validation of the collected data, this MIS generates different visualizations and summaries of the full or a subset of data and is capable of exporting those in various standard data output formats. We were assisted by Ona Inc., who helped us setup the server-side data collection software (Ona Platform) on local severs in Kathmandu. Progress Monitoring and Visualization Tool: This tool enables near real-time progress monitoring of the ongoing survey in multiple districts, this Progress Monitoring and Visualization Tool furnishes rich summary information through various interactive maps and charts. MyRepublica wrote about it in its cover story. Read the full article here. Following the successful conclusion of the survey in 14 districts, a similar survey was carried out in the remaining 17 out of the total 31 earthquake affected districts.